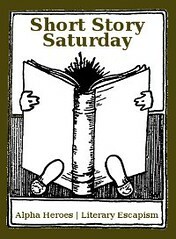 Alpha Heroes hosted it during December, but it’s Literary Escapism’s turn to bring you Short Story Saturday. The idea is very easy…did you recently review a short story or anthology? Then share it. I’ll be reviewing Karen Mahoney’s Falling to Ash, which can be found in the The Eternal Kiss anthology, edited by Trisha Telep later today (I must do the grocery shopping first), but I want to see what everyone else is reading. FYI…Mr. Linky is having issues. He should be back soon.